There are two types of Vestal damper plate controls, poker and rotary. The poker control comes with the Vestal Cast-Iron Damper and is 12" in overall length. 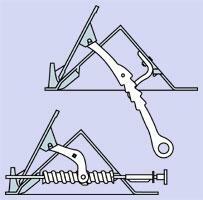 It consists of a "catch" piece that bolts to the damper frame, and a control arm which attaches to the damper plate with a cotter pin (provided). Moving the hole in the control arm regulates the width of the damper opening. Rotary controls do not come standard with the Vestal Cast-Iron Fireplace Damper. They must always be ordered separately. The rotary control measures 19" and is easily installed.